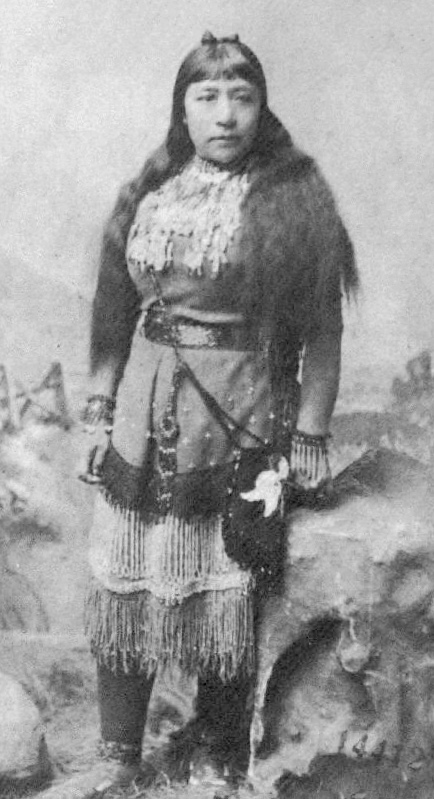 Sarah Winnemucca, a Northern Paiute author, activist and interpreter, was born in around 1844 in Nevada. 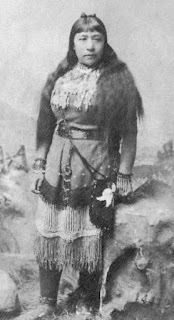 She was the daughter of Cheif Winnemucca. Her family was influential in trying to create peaceful relationships with the Anglo-American settlers. Sarah attended a Catholic school in California where she learned to speak both Enligh and Spanish. Sarah also became fluent in many Native American languages. These skills would allow her to bridge the gap between the Native groups and the settlers. Sarah returned to Nevada when white families grew uncomfortable with her presence in the school. Initially, her family had good standing with the settlers and was called on to perform and tour the area billed as the "Paiute Royal Family." However, worsening racial tensions led to violence that killed many members of Sarah's family. By 1876, a new "Indian Agent" was put in charge of the reservation, causing distress among the people there. The Bonnock war broke out when conditions on the reservation became unbearable. During the war, Sarah served as interpreter, scout and messenger. Thankfully, the war had few casualties because the two armies got along well and rarely attacked each other. When Sarah's people were relocated again, she followed. She held an official job as a translator and was not required to reside on the reservation. When she saw the poor conditions her people lived in, she became to tour the country speaking about the plight of the Native Americans. In 1883, she published the first book written by a Native American woman, Life Among the Piutes, which detailed the struggle she and her people faced. Her speaking and writing earned enough attention and petition signatures to convince Congress to pass a bill granting many of their requests. Sadly, nothing ever came of this bill. The end of Sarah's life was plagued with illness and financial trouble. Her husband died of tuberculosis in 1887. She passed away of the same illness in 1891. Her advocacy didn't get her people all of their demands during her life, but she set in motion many things to help better the lives of Native Americans. In 1993, she was inducted into the Nevada Writer's Hall of Fame and in 2005, Nevada placed a statue of Winnemucca in the National Statuary Hall Collection in the U.S. Capitol. Read Sarah's book, which is still in print.